Where Can I Purchase Quimper In The USA? The Merchant of Prato is your source for Quimper within the USA and Canada. We are a main distributor for Henriot Quimper and have the largest selection of Quimper anywhere in the USA. 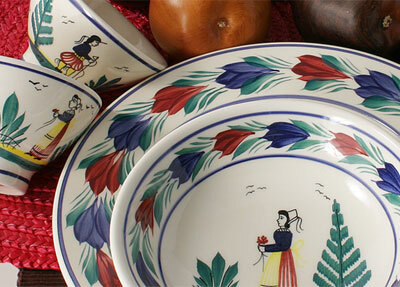 We keep a large assortment of IN STOCK Quimper items which we can mail to you within a few days. If you desire something we do not have in stock, we can order this from the factory and have to you within 10-12 weeks. The Merchant of Prato is happy to assist you with any question you may have on Quimper Faience. If you seek an item or pattern that you do not see on our site, contact us and we will see if The Henriot Factory can create your item.